This all started because I found a hole in one of my favorite t-shirts. It has all the qualities I love in a T, and the hole was front and center, obvious, and not fixable. I’ve been wanting to try both bleach pens and reverse applique, and this seemed like the perfect opportunity. Besides, we’re going to Disneyland at the end of the month to celebrate our daughter’s graduation from high school, so an appropriately decorated shirt is in order. 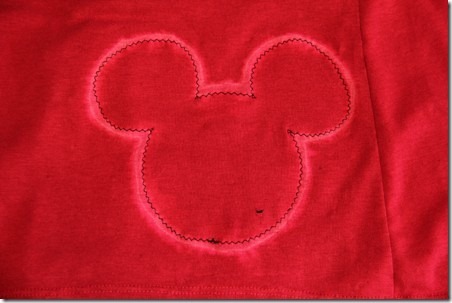 My original plan was to trace around the mouse head with a bleach pen to create kind of a glow, then move on to the reverse applique. But I learned something very important: bleach pens go bad. I thought it wasn’t working because my red shirt has synthetic fibers in it, so I pulled out the black T, which is cotton, and tried it. I ended up letting them both sit all night and not one bit of dye was lifted the next morning. After a trip to the store for a new bleach pen I was much more successful. I started by printing the design I wanted to use on the non-shiny side of a piece of freezer paper. I’ve done this many times with no problem, but this time I jammed up my printer. Make sure your paper is lying flat before feeding it through. 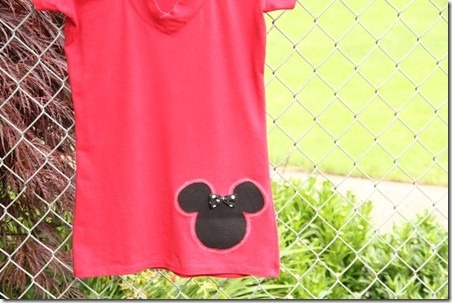 Cut out the shape and iron the shiny side onto the shirt. Also iron a piece larger than your design to the opposite side to prevent the bleach from bleeding through to the back. I also slide a piece of cardboard inside the shirt for extra protection and to give me a flat surface. If you have a design with more than one piece, I recommend using the paper you cut away as a placement guide, like I did with the dragonfly I made on the black shirt. Shake the bleach pen well, then draw a thick, even line around the outside of the shape. Keep in mind if you have very many lines to draw that what you drew first will fade the most. Rinse the bleach off thoroughly. The amount of time you need to wait for the color to lift can vary. I let this sit on the red shirt for 10 – 15 minutes, and the change was still pretty light. I only had to leave it on the black shirt for a couple of minutes. I originally planned to reverse applique the wings on the dragonfly, but I liked the orangey-red color it was turning so much I filled them in with a swirl pattern instead. I continued on with the mouse though. 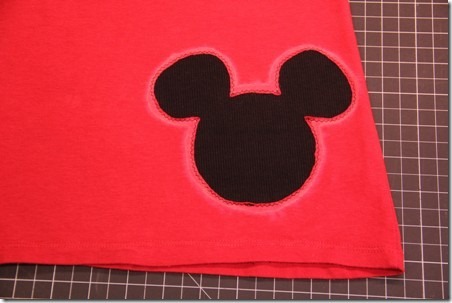 For reverse applique, you need to sew a piece of fabric underneath your design and cut away the inside fabric on top. I went with some black ribbed knit I had left over from a pajama project. Cut a piece larger than your design. Pin the fabric to the back of the design. LOTS of pins. I found sliding my small cutting board inside the shirt helped a lot. It kept everything flat and I didn’t have to worry about accidentally pinning through the back. Stitch around the design. I stitched just inside the bleach line with a small zigzag, so everything could still stretch. If you are a beginning sewist, I wouldn’t recommend a design with this many curves. It was tough to keep from stretching the fabric. Turn the shirt inside out and cut away some of the added fabric. Be sure not to cut the shirt or stitches. Turn the shirt back right side out and use a small, sharp pair of scissors to cut away the t-shirt fabric inside the stitching. The hole in the my shirt turned out to be useful, since it gave me a starting point. Cut all the way around, close to but not through your stitching. I felt like my Mickey was more of a Minnie, so I made her a little bow and sewed it through both layers. I’m completely hooked on both of these techniques, and have already been searching my closet for more holey shirts. I don’t know what the actual life span of a bleach pen is, but I have a feeling this one won’t find out.